Chicken a la Maryland is none other than famous fried chicken. 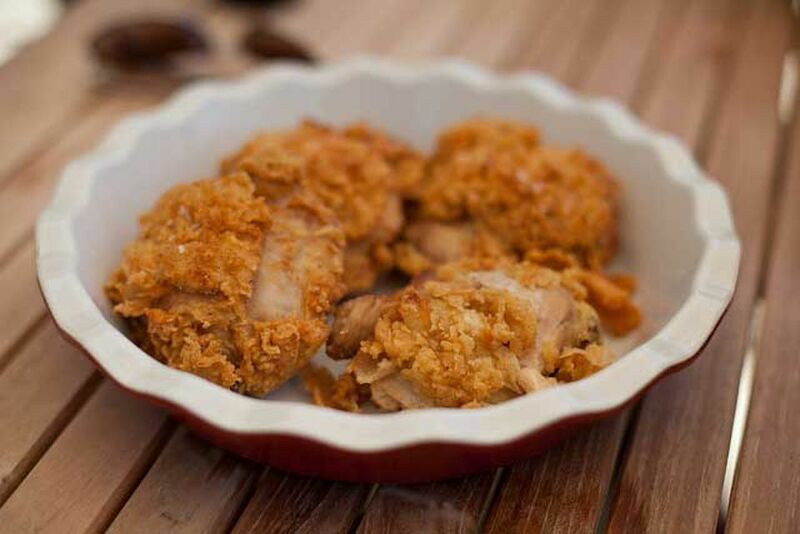 This Maryland chicken recipe is a loosely adapted take on Escoffier's version in Ma Cuisine, in which he dredges the chicken in flour, eggs, and breadcrumbs, and then fries it in butter. Escoffier's version and countless others include some form of banana garnish because bananas were one of Baltimore's prime imports around the time this dish became popularized in the United States despite its origins in French cooking. Chicken a la Maryland, presumably prepared with a decidedly French twist, was offered on the very last menu of the doomed Titanic voyage in 1912. The dish was served in first class and possibly second class (third class had much less fancy foods and would be unlikely to have had this dish). In a large, shallow pan, place the chicken in the buttermilk and marinate it in the refrigerator for 1 hour. Preheat the oven to 375 F. Melt 6 tablespoons of the butter in a large roasting pan. Drain and discard the buttermilk. Dredge each piece of chicken in the all-purpose flour, then the eggs, and lastly, the breadcrumbs. Arrange the chicken breasts in the roasting pan and bake them for 30 to 40 minutes, turning once. Make the béchamel sauce while the chicken is cooking: In a large saucepan over medium heat, melt the butter and whisk in the flour until it forms a smooth paste. Continue whisking, cook for about 2 minutes, and then gradually (1/3 cup at a time) add the milk. Continue whisking and cook until the sauce is completely heated through, smooth, and thickened. Remove from the heat and season with the salt and nutmeg. To make the banana garnish, melt the remaining butter in a large skillet set over medium heat. Sauté the prepared banana slices in the butter until they turn golden brown. Assemble the Chicken a la Maryland by arranging 2 pieces of chicken on a warm plate, drizzling it with a bit of béchamel sauce, and then garnishing the plate with a few slices of sautéed banana.